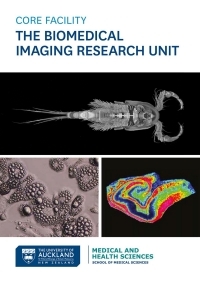 The Biomedical Imaging Research Unit (BIRU) provides research infrastructure and support and is located in the School of Medical Sciences within the Faculty of Medical and Health Sciences at the Grafton campus. Find out about our imaging modalities. See what support equipment is available. View a selection of images from BIRU equipment users. See winning and highly commended entries. See photos from BIRU events. Find out about imaging, suppliers, workshops and conferences. Read about courses that our unit is involved in. Contact individual staff members at our unit. 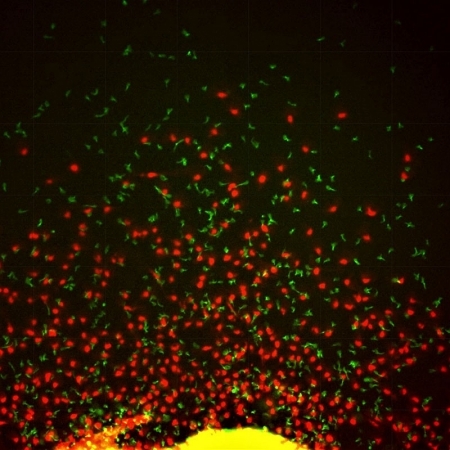 Quantitative multi-parametric analysis of biological imaging is fast emerging as a crucial area in biomedical research. This progress towards increasingly advanced image analysis is made possible by the confluence of molecular and cell biology, microscopy (and nanoscopy), image processing algorithms and data science within a single biomedical image analysis workflow. Currently, NZ researchers are doing high quality biomedical imaging through many different modalities. However, the image processing and data analysis parts are mostly low throughput and manual. Collaboration between the different discplines to improve the image analysis workflows is largely ‘ad-hoc’ and many biological researchers are not familiar with the ‘state of the art’ in the other domains (e.g. advanced image processing algorithms for better object segmentation and parametrization or machine learning mediated automatic classification of objects or unsupervised clustering of objects in multidimensional space to identify new patterns and clusters). Dr Gus Grey has been appointed as the new Director of BIRU, replacing Dr Sue McGlashan who has moved to a new role. Dr Gus Grey is a Senior Research Fellow in the Department of Physiology, School of Medical Sciences. He studied at the University of Auckland, and graduated with a PhD in Physiology in 2007, having investigated the functional implications of ocular lens membrane protein distributions by fluorescence confocal microscopy. If you are interested in hearing about imaging seminars and other BIRU activities, join the BIRU mailing list. To join the Network of BioMedical Image Analysis, (NoBIAs), email us.